JCEconomics.com is a MOE-registered leading Economics tuition centre in Singapore that provides Singapore-Cambridge GCE ‘A’ Level Economics tuition. 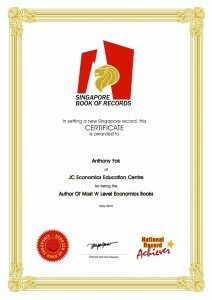 With numerous years of teaching experience behind him, Mr Anthony Fok, JCEconomics.com’s principal tutor, has been acclaimed by the Sunday Times newspapers as one of Singapore’s 5 most sought-after tutors. He holds Bachelor of Accountancy (Honours) from Nanyang Technological University (NTU) and Masters of Education from Monash University, Australia. He was also a former Ministry of Education (MOE) school teacher and is now currently pursuing Doctor in Education. is also the author of several Economics books including the GCE ‘A’ Level Economics H1 and H2 Ten-Year-Series, published under license from University of Cambridge Local Examinations Syndicate and is also the author of several GCE ‘A’ Level Economics Guidebooks such as “GCE ‘A’ Level Economics: Understanding the Singapore Economy” and “A-Level Economics: Learning Via Diagrams” sold in Singapore and overseas. Many of Mr Anthony Fok’s students have testified to his teaching abilities, with many reporting drastically improved grades, all thanks to his innovative tuition classes. Each tuition session is carefully designed to execute specific learning objectives focusing on case study and essay-writing skills development, while nurturing in students a genuine interest and appreciation for the subject. for students to learn how to explain and evaluate real world problems and suggest policies to solve such prolems. It pays special attention to the Singapore economy. Most schools cover Microeconomic topics such as demand, supply and elasticity, market failure, cost of production and market structure in JC 1. In JC 2, students will learn Macroeconomics topics such as inflation, unemployment, balance of payment, economic growth and international trade. H1 Economics is largely similar to H2 Economics in terms of the overall focus as well as the academic skills tested, with the degree of academic rigour similar. However, the content topics covered in H2 syllabus is more than that of H1 syllabus. We are located at both Bukit Timah Shopping Centre (Beauty World Stn) and Tampines. Click below to locate us! Postgraduate Diploma in Education (PGDE) from National Institute of Education (NIE). Masters of Education from Monash University. Currently pursuing Doctor of Education (EdD). Author of numerous GCE ‘A’ Level Economics Guidebooks. Author of H1 and H2 Economics Ten Year Series. Member of the Economic Society of Singapore (ESS). Member of the American Economic Association and the Economic Society of Australia. Member of the Australian Association for Research in Education (AARE). Former Ministry of Education (MOE) teacher. 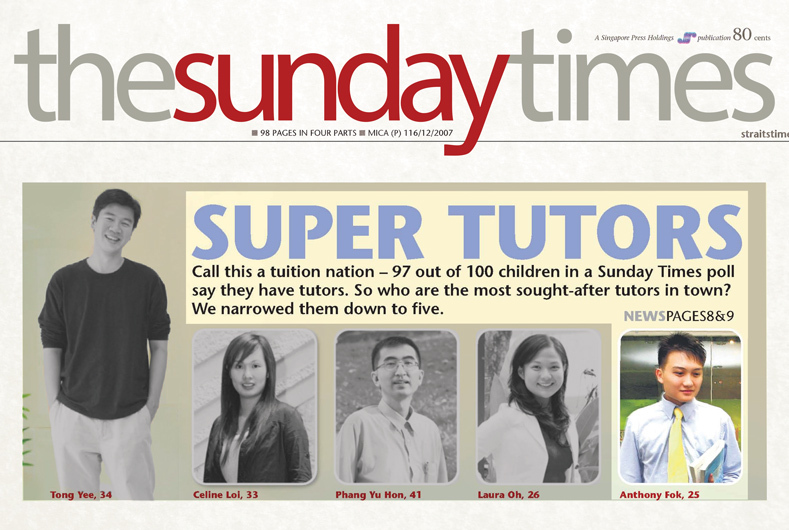 Featured on The Sunday Times newspapers as one of the five most sought-after Super Tutors in Singapore. Featured on The Friday Weekly local Chinese newspapers as an inspirational and dedicated school teacher. Featured on The Sunday Times newspapers as an “Economics tutor who puts theory into practice”. Featured on CNBC TV “a well-known face of Singapore’s booming private tuition industry and a part of an elite group of super tutors” in Singapore. Featured on MediaCorp Channel 5 TV programme ‘Made in Singapore’ as “an educator with extraordinary qualities”. Guest speaker on ‘MediaCorp Channel 5’ TV Programme “The 5 Show” about tuition and enrichment classes in Singapore. Featured on ‘Singapore Business Review‘ magazine as a “top tutor who brings economics theories to life”. Featured on ‘Today’s Parents‘ magazine for “educating the new generation using unique teaching methodology”.